How will Intuitive Eating stop me from inhaling this bag of cookies? You’re standing in the kitchen with the bag in your hand, and all you want to do is eat as many of these cookies as you can as fast as you can. How can Intuitive Eating prevent that? It can’t. Go ahead and eat the cookies. Really. 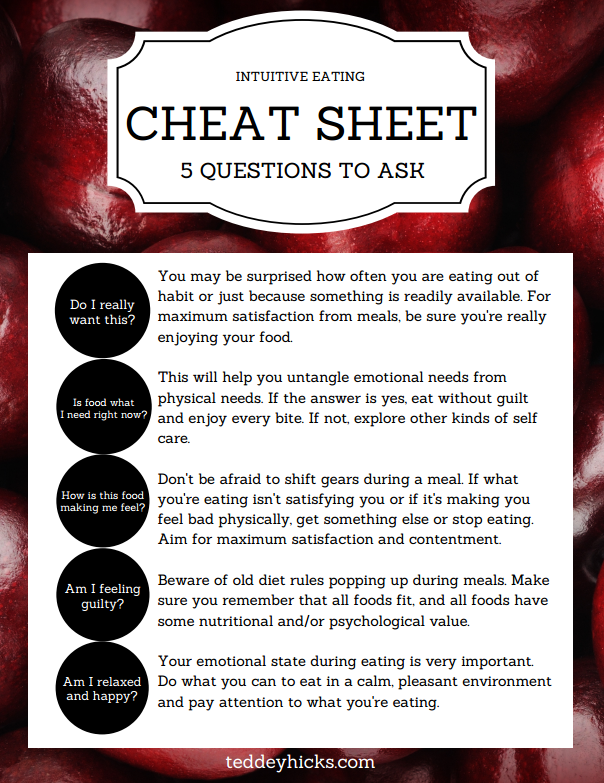 Intuitive Eating will not intervene in a crisis and save you from yourself. That’s like calling your mechanic and asking for help when your brakes have failed and you’re about to run off the road. There’s nothing she can do to help you in that moment. The best you can hope for is to learn a valuable lesson and prevent that crisis from happening in the future. Maybe you should’ve had some preventative maintenance before taking that trip? That’s not to say Intuitive Eating won’t play a role in the cookie situation. It’s not just going to stand there and watch you, shaking its head. As it’s starting, try and identify why it’s happening. Even if you can just give two seconds to a thought like “I’m exhausted and overwhelmed and this is the only way I can get immediate relief” or “I didn’t eat anything all day and now I’m famished and panicked.” That’s it. In the middle, try and stay aware. Do you like the cookies? Are they making you feel good? Is there something you’d rather be eating? Is this helping or are you feeling worse? If you consistently use those three skills, you will immediately feel your relationship with food changing. You will be able to learn, not judge. You will stop wanting to use food in that way rather than needing to control yourself when it happens. It’s like taking the oxygen away from a fire so it naturally goes out, rather than trying to contain it once it’s out of control. The other day, I got home from work and I was starving and tired and stressed...the perfect storm. I headed for the cabinet. But as I stood there with my hand on the door, I automatically had the thought, “This is not going to make me feel better. What do I really want?” It turns out, I wanted chips and salsa and a cup of tea and to sit down and do nothing for a few minutes. And I actually felt better. And I didn’t have to control myself.